A reserve duty stint prevented me from writing any post election update in a more timely fashion, but no time like the present. Due to this fact, what usually could have been a few pieces, will be one, and we will cover a few different important post-election issues. Firstly, the Lighthouse of course called the race many hours before any major publication. While the media was saying this was a done deal (a HRC victory), we were saying it was quite close (especially where it mattered, in the battleground states), and that there was a good shot at a Trump victory; and early news of victory in Florida and NC would put the Trump victory at around a 70% chance. When the networks were still hours away from even hinting that NC and Florida were leaning Trump, I posted that he had in fact taken those states, and a Trump victory overall was likely. By the time the news media started to say that the night still looked like a sure Hillary victory, but was certainly a lot closer than they had expected, we called the race for Donald Trump, probably around 7 hours or more before any other major news outlet did; and in fact it seems that the mainstream media has yet to reconcile itself to, or in fact report, the Trump victory (when this line was written). How can this be? Easy… no prophetic powers are needed, we were looking at data from precincts at the country levels as they came in, while most people, understandably, were listening to the news media. The facts are stubborn things. It requires time, effort, thought and intellectual confidence to believe one’s own eyes instead of what “the experts” are saying. A feat most people lack one or more of the requirements to achieve in most circumstances (ie a Doctor tells you to take medicine x for symptoms z, and one may be likely to take his word for it rather than research the primary data-sets for the drug’s efficacy). And this leads us straight to the most incredible aspect of this election; the people were able to speak their mind, to the contrary of an overwhelming set of powers and “experts” who told them this was tantamount to suicide. Like Mr. Churchill, I am not the biggest fan of Democracy, though struggle to find something better (the “at a distance” democracy or republicanism further limited by Constitutional constraints of the American founding fathers is certainly far better), and it’s easy to see its obvious shortcomings. The majority is by default a “C” at best. The majority is less enlightened about any given topic than a more enlightened minority. There is little inherent morality to the dictatorship of the 51% over the 49%. And that is an ideal democratic situation; in practice the dictatorship is that of a loud or influential minority over the majority. Being less enlightened about any particular topic (and by no means due to a lesser intellectual capacity, though that can play a part too, but merely and more totally by having different areas of focus and interest – For example I know nothing about fashion among many other things, but I don’t hinder the industry with my ignorance, other than as a lone consumer or non-consumer, because I don’t vote for it’s President or legislative body), the majority or mob is easily led and misled to conclusions. For example, we endlessly hear about the corrupting power of money in politics, inescapably linked to how expensive a successful political campaign, especially a Presidential one, has become. However, there is little that money can do other than purchase paid advertisements in various media. And the extent one can purchase an election, is correlated the worthlessness of the majority’s opinion. Of what value was it to begin with if watching a couple of paid ads would sway it’s decision, and what indicates that the “pristine” pre-advertisement opinion of such a majority would be any better? The fact that money can “buy” elections indicates of what little value the majority’s opinion is. To this frame of mind came the incredible 2016 election result. What we saw was an upset of everything stated above. The combined power of the USA and world elites, media, academia and the massive HRC and DNC campaign warchest. To add to this, the political establishment, in the form of bureaucrats, the Democratic party, and even large part of the Republican party was violently determined to see Trump fail. Their methods were many, and included everything from propping up the hapless HRC as a positive candidate (she has done little, even less good, and has a massively corrupt history along with her husband the Clinton foundation), to demonizing Donald Trump and anyone who supports him. This was not the normal type of “demonizing” that goes on in politics but a completely different level, where the mere opinion of supporting him was unacceptable, not a differing opinion but actually simply unacceptable, akin to being a Nazi. Additionally, it meant somehow that you hate women and condone sexual assault. The combined power of these forces, social, financial, academic and political is hard to overestimate. The experts of the world had spoken, and their word that if you supported a Donald Trump presidency, you were an imbecile; and worse yet, you were putting in danger the very existence of the universe. The fact that the average man and average woman, were able to come down in droves (“The Highlanders are coming down on their own – in droves of hundreds and thousands”), and use their constitutional-given right to hold their own independent opinion and cast their vote faithful to it was awe inspiring, humbling and shocking. My reaction at the time. The fact they were able to do this I believe is largely due to two main factors. First, the depth to which the so called “silent majority” identifies with and holds dear the basic American principles and identity, those enshrined in the Constitution and the Declaration of Independence, as well as those entwined in the traditional American fabric throughout its history, cannot be ignored. Machiavelli noted that Roman valor was not yet dead in Italians’ breasts, and America to a large extent is still the land of the free and the home of the brave. The deep-seated belief in traditional American values not withstanding, we know from experience they have been long dormant and taking a back seat to modern, euro-style, political correct, progressive and leftists trends in large portions of the population in recent years and even decades. It has been simply impossible to voice opinions that have been voiced in this election, and certainly impossible for a candidate to do so and remain a viable candidate if not literally remain out of jail. This leads us to the second factor, and it is perhaps the more important one in why the Trump phenomena happened when it happened as it happened; things are simply so bad. As rich and powerful as America was, and as rich as powerful as the Western World was, overtures mistaken as kindness by the givers, and understood as weakness by the receivers, were easy to get approval for. As things got worse, those overtures were no longer truly thought of as kindness even by their proponents, but rather driven by fear and forms of appeasement. Still, while the sun shone, anything was better than making the tough choices. A perfect storm of circumstances (Katrina, the financial crisis, etc), with the help of the leftist media allowed the ushering of the age of Obama 8 years ago. Had Americans been told on the morning after the Sept 11 attacks, that the very next president would be named “Barak Hussein Obama”, they would have figured America lost the war that had just started, and been invaded and occupied. The Lighthouse has not failed to warn about what that administration would mean, and what its policies would cause… but 8 years later no amount of political correctness can gloss over the obvious. Neither the media and political elites, nor the academic and corporate leadership could convince the American public of the reality that stood before them. The issues before us are somewhat complex, and not many understand most if any of them fully, but the writing on the wall can’t be missed. The social, economic, military and moral decay is rampant and accelerating. Over and over the people are told they cannot identify with whomever they and their fathers were, not as a nation, a religion, an ethnicity nor a people. Multiculturalism is thrust upon them as long as it means that everyone else’s culture should erase their own and everyone else’s should somehow remain intact. Any memory of traditional values, gallantry, honor, rugged individualism, and especially manhood have been order to fade into a historic oblivion in the same breath as slavery and other “evils”. The resultant youth can hardly tell what of what gender they are, what gender even is, while they seem to be able to tolerate nothing at all of any kind for any reason. Giant advances in technological productivity, matched by few in any in all of human history, have created massive wealth and efficiencies that seem to evaporate into thin air or concentrate in the hands of tiny few. With the fall of the other superpower and the end of the cold war, rather than peace and stability we see an increasingly violent third world threatening and overwhelming the first. While the news tries to mask the crumbling of the west, by either telling us it is a great thing or an evolution of what the West means, everyday life tells the average hard-working American that something is really wrong; as hard as he works, he can hardly do better than live paycheck to paycheck, and though he doesn’t know it, he works mostly to feed an ever growing massive bureaucratic hydra with federal, state, local and corporatist heads. As what he earns and has continues to diminish, he is ever reminded that he and “we” must give more.. to everyone from his very enemies that want to kill him, to the rest of the third world and to his own neighbor who refuses to work. Larger and larger portions of American have opted out of business, and of working at all under these circumstances as the bloated masses of dependents increases. But the average American is still a far cry from today’s modern Greek or Spaniard, and he wants to work, and he refuses to give up and go on the dole. Not being able to crack, nor to make a decent living, he reached his boiling point, and voted his mind. So who was this average man? Well, firstly, although inescapably Trump’s support among men was stronger than among women, but the true heroes of this election and this democracy were in fact women. It was well known that Trump’s support among men was substantially higher than Hillary’s, but no matter how high it got it could not overcome the overwhelming lack of support for Trump among women, who represent the majority of the electorate. Even if a good majority of men voted for Trump, he could not win we were told, since all women despise him for his misogynist sexually predator ways. And any woman supporting him would have to be not only a “traitor” to her gender (which apparently exists when convenient), but also insane or mentally deficient. Well, this race broke down along.. well.. race, despite the pun, and not gender as the pundits would have us think. And though white men came down and handed Trump a handy majority of around 62% to Hillary’s measly 31%, it was white women that handed him his victory. Donald Trump got (according to major exit polls) 52% of white women to HRC’s 43%, an amazingly large margin in favor of Trump. And this statistic more than any other, is responsible for the incorrect predictions. I am incredibly and pleasantly surprised that so many women of all ages, were able to withstand the propaganda blitz so intensely aimed at them specifically, have the confidence and self-assurance of knowing that they are not victims, of believing their own eyes and ears, of knowing their own minds, and acting for the benefit of their country. These numbers for both white men and white women are strikingly higher towards Trump if one excludes only California and New York, which are so heavily Democrat. Across the rest of the nation, it was quite a landslide. Now of course, Trump did not earn a majority of all women’s votes, (though he did those of men, at 52% nationwide), but that has more to do with race than gender. Across all races and ethnicities, his support among men was somewhat stronger than among women, but that margin was very small compared to the differences in racial voting patterns. To put it differently, while he won both the majority of white men’s and white women’s votes, he did not get any majority, of neither men’s nor women’s votes, of any other major racial group. At the same time, GOP candidates traditionally do not win these minorities, regardless of how PC they are, and in fact Trump did substantially better among some than did Mitt Romney just 4 years ago. For example, 32% of Hispanic men’s votes were for trump, while 13% of black men’s were. Trump did better with both these groups, both among men and overall including both genders, than did Mitt Romney who specifically bent over backwards to appease the hispanic vote (which without we were told no GOP candidate could win again, and I wrote about early on in Trump’s election). In many ways, Trump’s policies are those that challenge the politics of appeasement. Though everyone thinks they know it is not a very effective tool when the word is actually used (due to the infamous “peace in our time” of Mr. Churchill’s unfortunate predecessor), it is actually incredibly popular as strategy in issue after issue. There are diminishing returns in self-immolating in order to appease a group that fundamentally oppose you. One can argue that as silly at is to adopt policies that won’t make the likes of Al-Qaeda or ISIS or Hamas “angry”, it is politically analogous to the GOP’s consistent betrayal of its base for the appeasement of Democrat-leaning minorities. Trump actually got an overwhelming number of white American votes, without sacrificing any minority votes that a GOP candidate gets anyway. In fact, he got more than what was expected. Hispanics particularly, much like women in general, were targeted by the demonizing propaganda of the left and a Trump voting Hispanic was apparently as mad a female one (I suppose a Hispanic woman voting for Trump would be ultimate insanity, and even that happened a quarter of the time!). The fact is that he was able to attract pro-America votes, from those who can see past the politics of race and victim-hood, of any gender and ethnicity, while not bothering to appease those who are fundamentally either un-American, viciously anti-GOP no matter what, or both. In fact, few are likely to benefit more from a Trump economic revival than Hispanic and blacks (which I wrote about here as an appeal to minority voters before the election). There were those that realized that, and those that are stuck believing their votes are owned by the Democratic party for no apparent reason. The next lie the media tried to sell the public was that Trump voters were uneducated (“deplorables” HRC called them), or at least that they don’t have a college degree. Some people’s first reaction to that is to figure that it is hardly a surprise since today’s colleges and universities seem to do little other than indoctrinate innocent and ignorant students with leftist (which they call “progressive”) political and social thought. While the impact on the West of the left’s near monopoly of academia is hard to overestimate, the reality here is little more than a cheap statistical trick. and for the remaining white male poor bastards, if you do so, you are uneducated! So if you have a degree, you would feel stupid and acting beneath your class if you dared to oppose Hillary, and if you didn’t have a degree, you should vote along with the smart guys and better yourself! The truth is that this was nothing more than statistical sleight of hand. As we mentioned this election broke down primarily along racial lines, followed by geographic factors. College degrees did nothing to erase that fact. Firstly, notice that whenever the media indicated that Trump’s support was strongest among the less educated, it was always “non college degree whites”. Why the add the “white” detail? Well, the US population still gets “more white” if you consider only degree holders. And a more white population meant increasing Trump support according to the pre-election polls. Hillary got her strength from minority voters, and less of them tend to have degrees compared to whites (except perhaps for Asians who have topped the list for the past few decades)… so in order to call Trump voters less educated, you had to refer to whites only. Because the “less educated” minority voters were extremely heavily skewed towards Hillary. Regardless of this one may ask, why would support for Trump among whites decrease with education? Well, this is simply due to the second most important factor we discussed, geography, and subsequently perhaps the third which is gender. Today, women have a large and increasing edge in the rate of bachelorette degree attainment, and have had one for the past decade or two. A more female-heavy population sample, would also of course skew numbers towards HRC. Finally, degree holding populations and rates vary widely geographically. Below are the top 14 states (and DC) in terms of percent of population over 25 with a bachelors degree or greater. Every single state (along with DC) above was won by HRC and nearly all of them are strongly blue-leaning states and have been so for at least the past few elections. In the list, are the most blue leaning states such as California and New York. So if you start concentrating your population sample among women and among residents of the most blue-leaning states, it is no surprise that you will move your average voter left. But this does not necessarily mean it had anything to do at all with college degrees or education. If we take the geographic factor away, this becomes even more drastically clear. For the Red States, exit polls show Trump tended to have a majority of graduate degree voters overall, and incredibly strong majorities of white men, with or without college degrees. These are the results despite the extremely strong pressure on college graduates to avoid voicing support for trump. These effort for sure affected not only their real votes, but the way they answered exit polls. Any remaining differences are likely simply masking more geographic factors that are not filtered out by merely separating votes by state. A quick glance at the electoral results map by county shows the drastic difference in voting pattern between rural and urban areas (which again, also tend to include racial differences). Cities were overwhelmingly blue, even in the middle of “Red Country”, and rural areas were red without fail, even in states such as California. 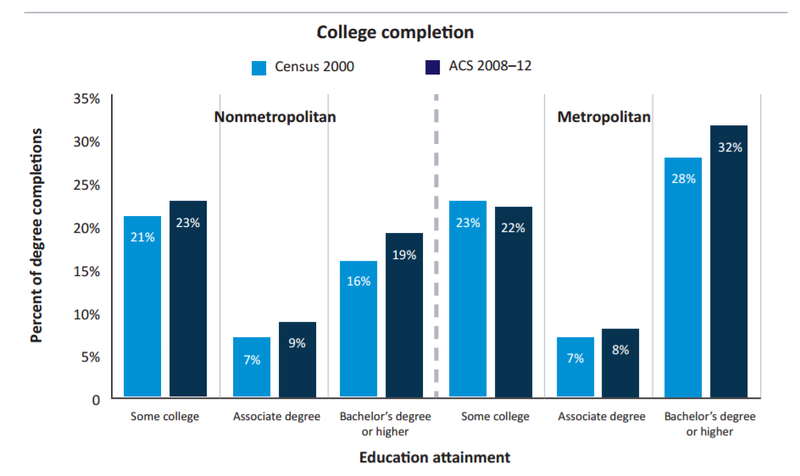 College degree rates are much higher in urban areas than in rural areas (below according to the American Association of Community Colleges for 2015).